Sugar cravings can be no joke. We all have them at different times for different reasons, so I am sharing 5 tips that I have found to be helpful when it comes to curbing those cravings. Eat more naturally sweet foods. Incorporating more naturally sweet foods into your diet is a great way to give your body the sweetness it craves without going overboard in the sugar department (plus they’re more gentle on the body). Some of my favorites include roasted sweet potatoes, oatmeal, butternut squash and spaghetti squash. Kick your soda habit. I know this one is obvious but I also know that a lot of people struggle with soda (I know I did for years!). The problem with soda is that they pour sugar right into your body which creates a spike and then a crash in your blood sugar. And guess what happens when you crash? You crave MORE sugar. It’s a viscous cycle and diet soda isn’t much better because studies show that artificial sweeteners have the body craving more sugar as well (plus they are loaded with artificial flavors and colors, blech!). My solution when I have a soda craving, is Zevia. It’s an all natural soda sweetened with the stevia plant and it is the only soda I will let my kids drink. I love that it has no artificial colors or flavors and that they make all the traditional flavors of soda that I used to love (including Dr. Pepper). Eat more healthy fats. Often times when we are not eating enough quality fat the result can be sugar cravings. Make sure you are incorporating plenty of quality fats into your diet on a regular basis including; nuts, seeds, avocados, and coconut oil. Enjoy a ‘not-so-sweet treat’. Sometimes, you just want to eat something sweet and delicious! So what I have found to be a huge help, is to reach for snacks that have a little sweetness but not too much. I find a handful of shredded coconut, super dark chocolate and macadamia nuts to be just sweet enough to satisfy my craving but not so sweet that I am left wanting more and more. My immunity boosting hot chocolate is another favorite snack when I am really wanting something sweet. Eat some fermented foods. Yes! It’s true. Fermented foods literally gobble up sugars in the body and have been know to stop a sugar craving dead in its tracks. Next time you have a strong craving for sugar, try enjoying a spoonful of fermented sauerkraut, kimchi, tempeh, miso, or a fermented pickle. You may be surprised at their ability to curb your craving. What tricks do you use to curb sugar cravings? 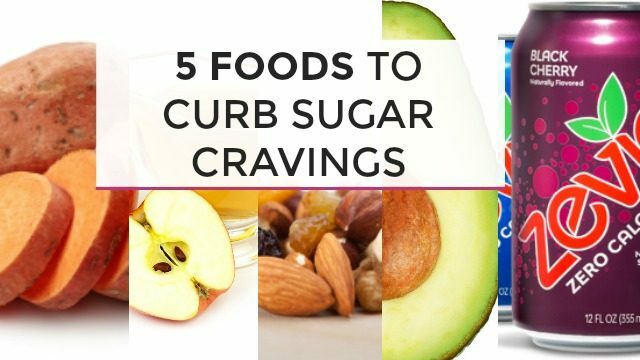 Please share down in the comments below and be sure to watch the video for more of my thoughts and tips on how to curb those sugar cravings!